my ultimate home decor style and taste comes down to a few things. colourful, retro or vintage and in bright summer hues. this doesn’t necessarily align to what i actually have in my home, thanks to lack of finances and a partner who doesn’t quite have the same taste as me! still, i do what i do, where i can. 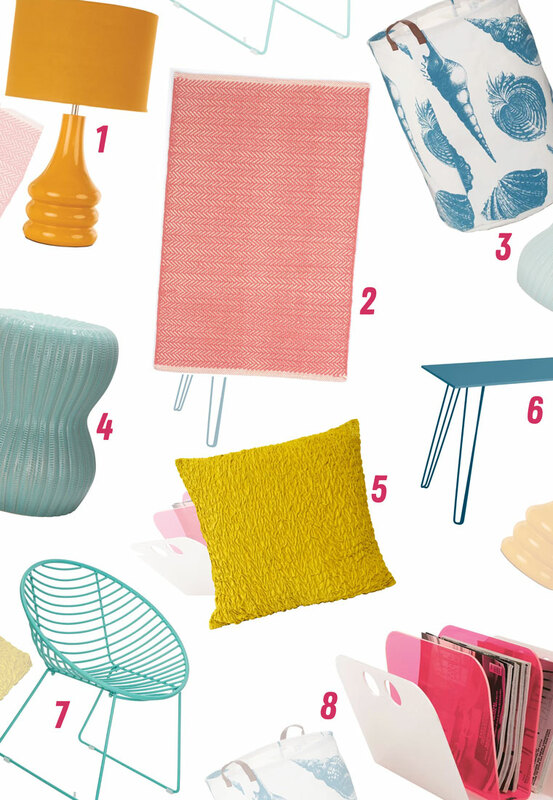 wayfair set me the task of picking some items based upon a theme of my own choosing, so naturally i had to go for colourful and retro with a summery twist. perfect for this time of year! or, to bring some cheer in the colder months. you know i’m all about the colour, no matter the time of year. definitely felt drawn to my favourite colours too. wayfair have a HUGE range of items, and you can always find what you want in every imaginable hue. i thought i’d give a little info as to why i’ve chosen each item. that mustardy yellow! love the simple lampshade and the super 60’s base. looks very sturdy and would be a great statement piece in an otherwise minimal room. i adore coral, and it looks fantastic combined with a herringbone pattern. i personally would love this for my bedroom to brighten it up. how amazing would it look on white floorboards though? can’t resist a bit of seaside. love this simple yet statement laundry bag. the leather straps are a wonderful touch. i can’t help but think this would look good in a children’s room too, to keep toys in one place. perfect for inside or outside, this stool looks beautiful on its own. alternatively, it would look cute with a small pile of books and a couple of trinkets on top. perfect for some outdoor seating, too. love items that can be used in multiple ways. i LOVE texture in cushion covers. my favourite one (from wayfair actually, a few years ago) has a twisted string texture and i’m not ashamed to say i love stroking it. this looks like it would be similarly tactile. of course i love the colour too. another multi use item. love the hairpin legs! would be great in the garden in the summer to put your drinks and snacks on. or just a generally useful indoor item. comes in plenty of colours, too. doesn’t everyone want one of these? i have for years, and i’d definitely want a turquoise or mint one. imagine chilling outside on this with a book and a refreshing drink beside you. ahh, bliss. this is amazing! basically i just love how it looks, but obviously it has it’s use too. generally i don’t like neon colours, but a little bit can go a long way. what do you think of these items, would you choose any of them for your home? what’s your style? dark yet colourful? minimal monochrome? or simple and bright like me? let me know!